Recently there has been a lot of hype surrounding Motorola’s New Droid Bionic Smartphone. This next generation Android based Smartphone was initially slated for a release date earlier this year, but was postponed by Motorola for some “secret” last minute changes. In an attempt to properly inform the general public (and possibly to halt the spread of false rumors), Verizon is now offering an official newsletter for those seeking additional details and specs, including the official launch date. 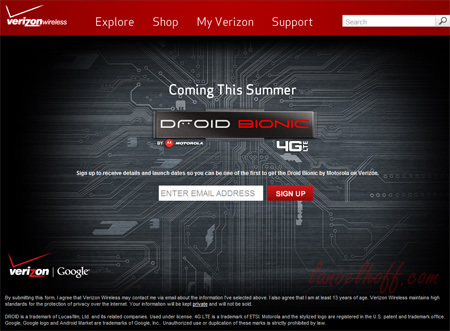 Sign up at the Official Verizon Droid Bionic Page and take advantage of the opportunity to be one of the first to obtain the New Droid Bionic.